Roller skating has been around for centuries, providing fun and exercise to people all over the world! Are you interested in teaching your kiddo how to roller skate? Make sure you dress her in appropriate gear, teach her the basics of roller skating, and bring her to our roller skating lessons! She will be racing around the rink in no time. Wear the appropriate gear. 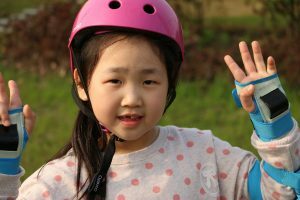 Make sure to dress your child appropriately with a helmet, wrist guard, and knee and elbow pads. Safety gear will soften the landing if she falls and protect important parts of her body. Practice, practice, and practice some more. No one masters any activity on the first try. Encourage your little one to keep practicing even if she takes some falls. (A helpful tip: Allow her to skate indoors on carpet so falls won’t hurt as much!) With your encouragement, her confidence will grow. Are you ready to start skating? Check out our hours of operation!